Hello and happy GRATEFULNESS FRIDAY EVERYONE!!!! The last gratefulness Friday giveaway with Victory Vintage was a huge success. PLUS, you guys totally spread the vintage love with 30 tweets and 61 likes to the post! YEAH LADIES!!!! Without further ado, I’m happy to announce the next Gratefulness Friday Giveaway with INDIE STYLE SOCIETY VINTAGE, an Etsy seller and fellow New Yorker. She’s graciously donated a few of her favorite vintage items that speak indie style for today’s giveaway — all you have to do is keep reading after the jump to learn how to enter for a chance to win! Well HELLO THERE! Thanks for clicking to read instructions on how to enter today’s giveaway, and to take a few minutes to read my positive musings in honor of living a life of gratefulness! I led this post today with an image of “thank you” because that is what gratefulness Friday is all about: Giving back to my readers (you!!) with a chance to win fabulous vintage for your exterior style, and to also inspire your personal style on the interior (within!). And to all you vintage lovers out there! Today’s giveaway sponsor Indie Style Society is offering a coupon code for 15% off her shop now through midnight on Monday, May 23rd. Use “SAMMYDAVISMay11” in checkout for the discount! Happy entering, happy gratefulness, happy weekends and happy VINTAGE LOVE! I AM GRATEFUL FOR … SMILING AGAINST THE GRAIN! Lately, I’ve been stopping whatever I’m doing at the moment to remind myself of one simple thing: to SMILE. Living in the city of New York, I pass hundreds of people on the street, subway and in the cafes, stores and wherever else I may be on a particular day. When I pause to truly take in these people living their days around me, I recognize that only a handful of them are smiling in their solitude. Sure, I see people smile when interacting with others they know, but how often do we see people smile when ALONE?! Last weekend I ran my first marathon, covering 26.2 miles in Pittsburgh, Pennsylvania. For at least 20 of those miles, I was SMILING. I was smiling against the grain because I wanted to enjoy each and every moment of that race … no matter the pain or exhaustion I was feeling. In fact, I didn’t feel pain and I didn’t feel exhaustion when I chose to pause in my mind (while my body was still moving!) to remember to SMILE. There is something so beautifully powerful about the smile. It can light up a room. It can attract you to your soul mate. It can make a baby laugh. Smiles are communication to others without saying a single word. It’s a piece of positive energy we are always in possession of, and as I experienced first hand running last weekend’s marathon … can give us strength in times of need. I want to smile as I walk the streets to run an errand or shop the grocery store. I want to smile at someone on the subway who I may never see again. I want to smile with the homeless man on the corner, to the woman who sells me fruit at the farmer’s market, to the operator on the phone when I call my credit card company to complain about an unnecessary charge! When we smile to others, we are smiling in celebration of them … WITH them. We are communicating the language of CARE … and not just to the person who is before us, but to the person who lives within us. We don’t need to pay for self-love through manis/pedis, a massage or a therapy session. We can love ourselves by choosing to love the moment and the people, activities and circumstances of it with a simple smile. Whatever that moment is for you today, if you can remember this message to smile, I promise that you will feel better in that moment than if you hadn’t smiled. Not all moments seem appropriate for a smile. But it’s when the moment seems the LEAST appropriate for a smile — smiling at strangers, smiling at a funeral, smiling when running 26.2 miles — that the TRUE power of your smile will shine through you … and live with you always. I look forward to hearing what makes you smile most when you enter today’s Gratefulness Friday giveaway! ENTER TO WIN THIS VINTAGE PRIZE PACK! 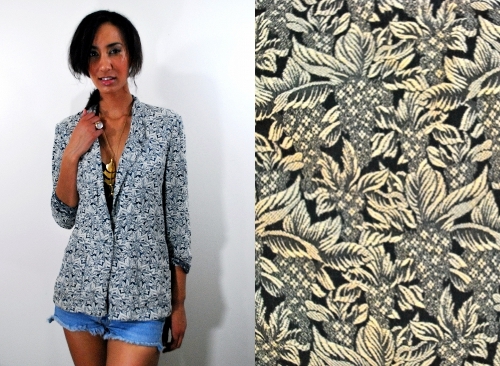 As pictured on the model, the blazer’s sleeves can be rolled up, and the piece pairs well with jeans (or jean shorts!) for a laidback look. For a chance to win these two pieces in the vintage fashion prize pack sponsored by Indie Style Society listed above and valued at $50, you must enter between today [Friday, May 20th] and by midnight on Monday, May 23rd. You can only enter once, and all winners will be drawn at random using the site random.org. Winners will be announced by Wednesday, May 25th. **Entrants/Winners must be legal U.S. residents of the lower 48 states (not including Alaska and Hawaii) and at least 18 years old as of May 20th, 2011. Happy entering and GOOD LUCK!!! 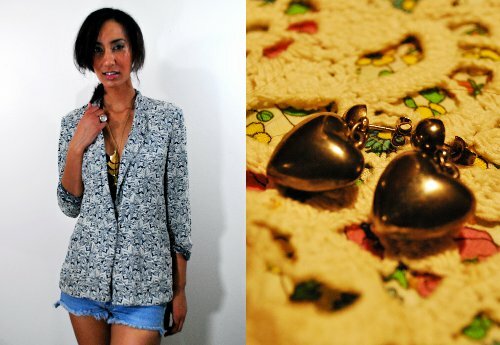 Gratefulness Giveaway: Win 5 Vintage Pieces for Spring! 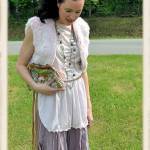 Gratefulness Giveaway: Win a Vintage Prize Pack from Lady Jane Vintage! What makes me SMILE is when my husband calls home. My lil pup Donna always knows how to make me smile, even on the worst days! How can you NOT laugh at a dog named Donna?! I smile when i see beautiful yet sadly unnoticed things. For example, dandelions swaying in the wind, moths flying about, when a youngster help a grandma cross the street, when someone helps a mom carry her stroller up & down the stairs, when someone stops the door for someone. Right now, through finishing school, I’m always smiling when hanging out with friends. We manage to find sunny spots to chat in. I would not make it past lunchtime with out them!! My mom…My mom provides endless surprises and she’s done everything to make my life as good as possible…sigh, I’m smiling right now. This is by far my favorite method to enter a giveaway. So sweet. Thank you. Thinking about my family always makes me smile. They are the strangest, rowdiest bunch of people I’ve ever set eyes on, but I love them! My best friend always manages to be great company and whenever I talk to him, he definitely makes me smile with his jokes and positive attitude. My boyfriend ALWAYS makes me smile. even on days when I don’t think I can! The one person that always made me smile in my childhood and my adult life is my father. He passed away 3 years ago, but every time I think of him or I see something that reminds me of him I just smile! I smile when I think of my family … today I smile because it is my Grandmother’s 93rd Birthday!!! and she has an amazing sense of humor that keeps us laughing! LOVE YOU GRANDMA!